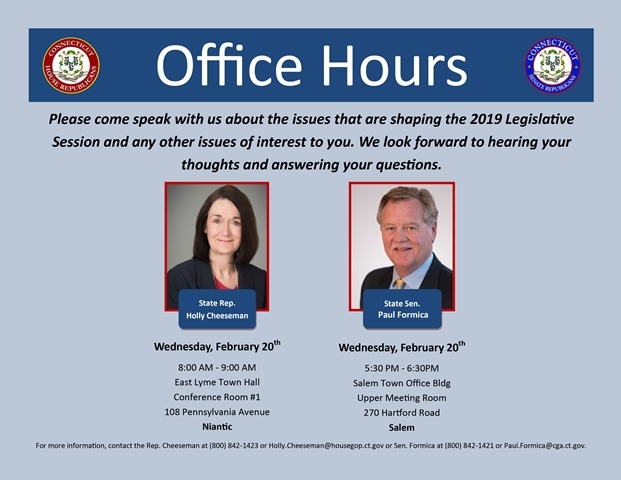 HARTFORD – State Representative Holly Cheeseman (R-37) and State Senator Paul Formica (R-20) are inviting constituents to meet with them at the East Lyme Town Hall or the Salem Town Office Building to discuss what’s happening at the Capitol this session. The lawmakers will be reviewing the major issues they are currently facing in the House and Senate, and the status of the state budget. They encourage constituents to attend if they have any questions or concerns about state government. These events are free and open to the public. 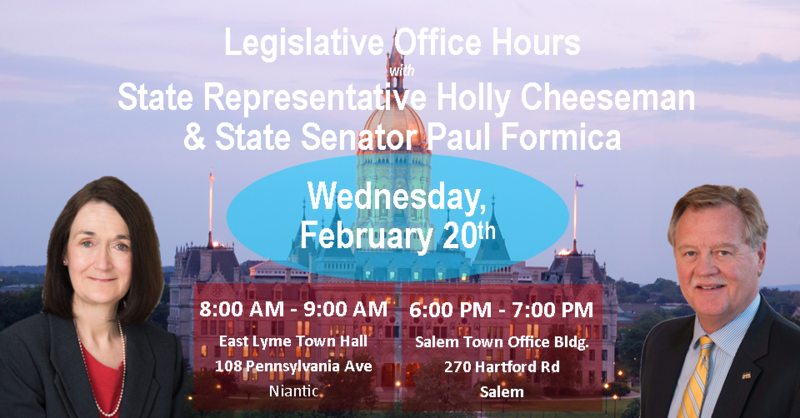 If you are unable to attend but would still like to connect with your legislator, please do not hesitate to contact Rep. Cheeseman at Holly.Cheeseman@housegop.ct.gov or (800) 842-1423; or Sen. Formica at Paul.Formica@cga.ct.gov or (800) 842-1421. In the event that either of the meetings must be postponed, a notice will be posted on the legislators’ websites at www.repcheeseman.com and www.senatorformica.com.